Corner of Fayetteville and Presnell across from Speedway Station. 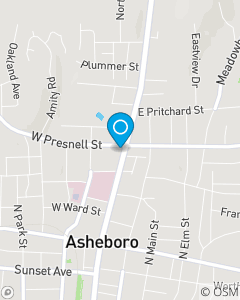 Our mission is to be the number one insurance provider in Asheboro / Randolph county. We make the insurance process as simple as possible. Everyday we wear our customer service HATs by providing customer service that is HHappy, AAccurate, and T Timely. Let us earn your business with our excellent service. We have three team members and the agent to serve you. Steven Atkins (office manager) is licensed in Auto, Fire, Life. Camilla White is licensed in Auto, Fire, Life, and Health. Sherri Hernandez speaks Spanish and is licensed in Auto, Fire. Katy England (Agent) is licensed in Auto, Fire, Life, and Health . Anyone who answers the phone can help you with most of your needs, so call us anytime or stop by and see us in person.